Time is flying by quickly and I can’t believe it’s February already. 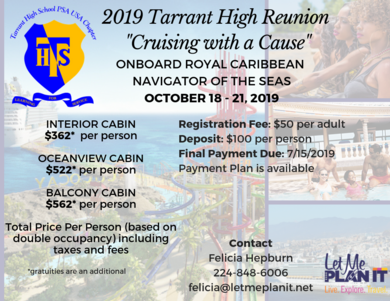 The 2019 Tarrant High School Reunion ‘Cruising for a Cause’ is only 8 months away. We are working on an itinerary that will not only allow you to connect with other Tarrant graduates, but will also spend quality time with your friends and family. With only 4 cabins left (1 Ocean View & 3 Inside) book your spot TODAY! Royal Caribbean prices have gone up and once these cabins are gone these prices are no longer available. Payment Plans are also available and all currency is listed is USD. Please contact Felicia with any questions about the cruise.